Copyright �2015 PopEntertainment.com. All rights reserved. Posted: October 8, 2015. 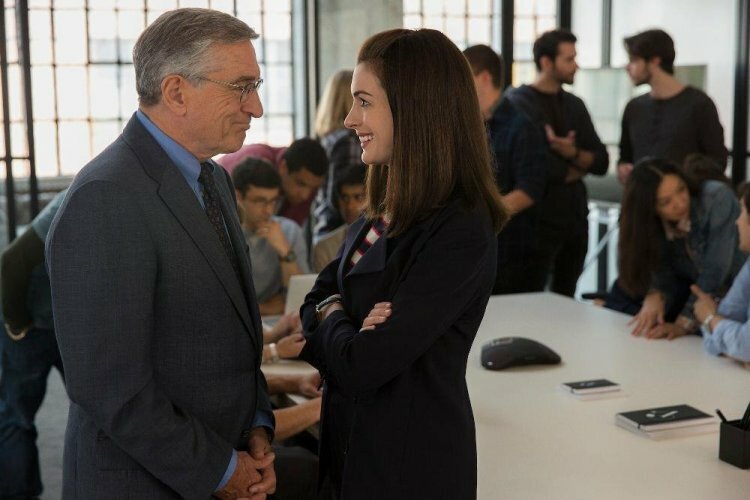 Ever since she's started talking about The Intern, it's been asked many times of actress Anne Hathaway what it was like to be Robert De Niro's boss. Even attending a press conference with acting legend De Niro is a rare thing, so when the 32 year-old Oscar winner was told that De Niro would play her intern, it was no surprise that she was not only a little excited but also more than a bit intimidated. After all he had not only won an Oscar, but had been nominated for awards many times over, worked with the world's best directors such as Martin Scorsese, co-created a world class film festival (Tribeca) and become a major player in the development of downtown Manhattan. 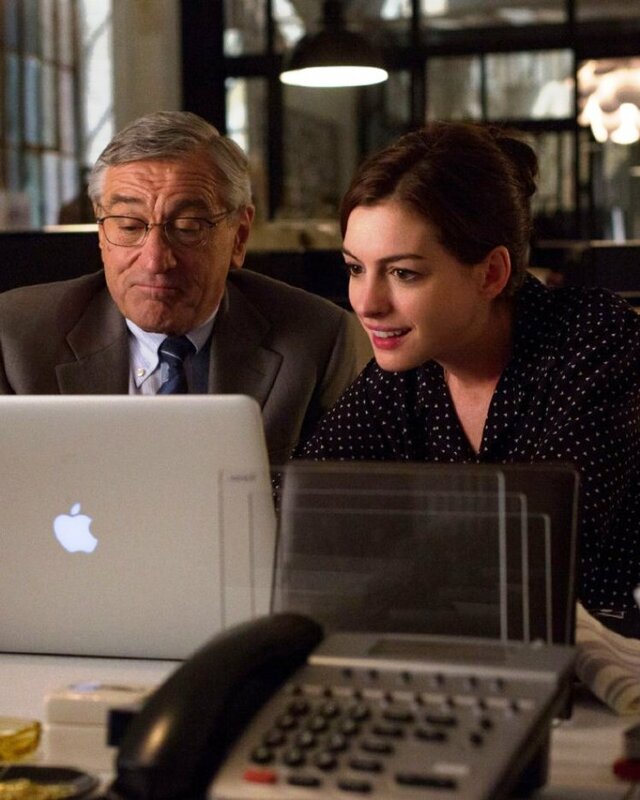 Okay, so De Niro wasn't actually Hathaway's intern. 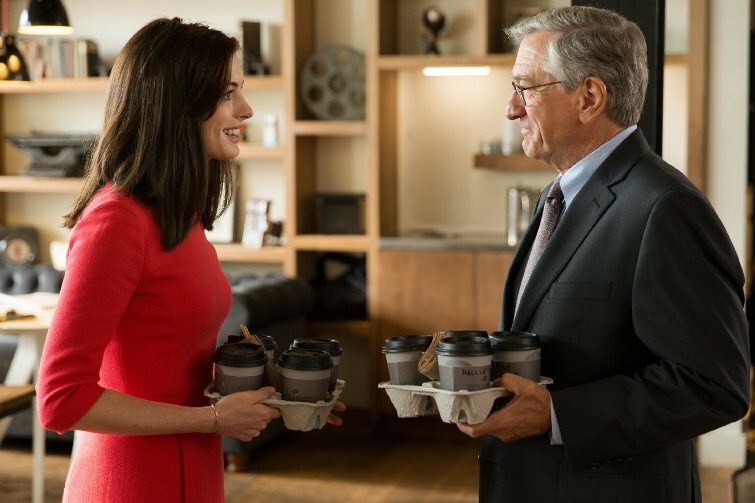 In the film, he plays 70-year-old widower/retiree Ben Whitaker who becomes the intern to Hathaway's character, tech entrepreneur Jules Ostin. However, any time you have this Oscar winner, so potent for his performances (his Travis Bickle in Taxi Driver is a benchmark for acting aficionados everywhere) taking orders from you, it causes you to take pause. Even when you're playing an online retailing superstar in director Nancy Meyer's The Intern. The 65-year-old Meyers makes films that find clever, engaging ways to address various social issues, particularly gaps in gender relations. Over her long career as a writer, producer and director, she's applied witty and fresh turns to such matters in various big-screen successes as 1998's The Parent Trap, 2003's Something's Gotta Give, 2006's The Holiday, and 2009's It's Complicated. Along the way, this Philly native surpassed Penny Marshall as the highest-grossing female director of all time. When the siren call goes out � that you're invited to question these three � you hope that the questions cover the concerns the film addresses: gender bias, ageism, tech ignorance, micro management, and the emotional baggage engaged when you become a business star at a young age. That's just a few of the issues that The Intern tackles. For some, this comedy about a young female founder of a cool fashion e-commerce company who agrees to a program where seniors intern at her firm seems regressive in retrospect. However, whatever conclusions the film addresses, this Q&A held at the Crosby Hotel enlightened with tales of the film's backstory. Now that it's all done and about to be out there, what do you think of the issues addressed in the film, and how they were approached here? Nancy Meyers: Obviously it's about the concept of retirement and that it might happen to you whether or not you are ready. This film is also about somebody's desire to stay part of things and not be pushed aside. I enormously enjoyed doing all the research I did about startups; I found that whole culture so interesting. And the fact that Annie plays a woman who's the founder of a company. I was saying to somebody that when I wrote Baby Boom, it wouldn't have occurred to me to make her the boss. Now, it wouldn't have occurred to me when I was writing Annie's character to make her an employee. I think the world has changed enough. I've been able to make movies over such a long period of time where I've examined the lives of these women who have families and children. Then I got a chance to look at the stay-at-home dad, [and] the mom who's running a company, and all that that entails. The primary thing is that I wanted to write about a friendship between two people that's, in its own way, a love story, but not a romantic one. Anne Hathaway: Obviously, [it's about] age and gender. One of the things that Nancy's done in this movie, and that she has done throughout her career, is find things that we relate to via humor and emotion throughout our lives. She usually has a knack for getting there first, and making [such] observations. In this case, she's really got her finger on the pulse in the observations she's made about generations, and gotten there before a lot of other people. I love that it's a movie that I feel like I can go to see with any of my friends. I have friends who are 20 years old, and friends who are 83. I can go to see [this one] with any of them. I'd love to see this movie with my parents. I don't know that we've had a movie like that in a long time, that can sort of appeal to everyone specifically, of every age, and they can find humor in it. This isn't so much of an issue in the movie, but it's just something I love about it. Nancy Meyers: It's the value of having Ben in her life. There's a boy for her in her life. Do you see this movie as a love letter to baby boomers, that it says, "You're not so old and irrelevant, you can use your wisdom and discipline to help another generation?" Robert De Niro: It's her love letter to us, to our generation, [especially] to us guys of our generation. And, it's fun. I hope the movie is seen by a lot of people because it is this kind of movie. We do tend to feel that when you're a certain age, when you get older, you're less relevant in some ways, and [this movie shows] that's just not the case. Either people who are just aware and sensitive to that when they're younger realize that, and when you get there, you certainly know it. Sometimes you don't know until you get there. There's a lot of people who are there, so hopefully they'll see the movie. Sixty years ago, actress Bette Davis called her autobiography, The Lonely Life. Was this something [that you see as] particular to successful women, wherever they are in society? Do you see it as lonely at the top for women? Nancy Meyers: I never would've thought of that, but when you said it, I thought, "That's interesting..." But I don't know about you. Anne, but it didn't strike me as any kind of loneliness as much as... I can only write what I know, so I can also imagine that any man who would have this company would need Ben. I don't necessarily think it's because she's female. When you're taking on a big thing like that, it's [all on] you; you're a one-man or one-woman band, so I didn't [necessarily] see it as lonely. But I don't know if you felt that, [in] playing her. Anne Hathaway: I'm so relieved to hear you say that, because I don't know how to answer that � that never occurred to me, or am I a bad actor? Did I not ask the right questions? I thought it was not because of a gender issue, but just because I think Jules is a private person, and that she's so dedicated to her company. She dreads the idea that anything in her personal life could impact on her ability to do her job and keep the company going. She doesn't really have anyone to confide in. Then she meets Ben and their friendship develops organically. She winds up opening up to him and taking his advice because she really, really, respects him and [he gives] really sound, excellent advice. Like I said, that's not forced, it happens organically, so I just thought, like what Nancy said, she was more isolated because of her position. One of the things I love about the movie is that Jules has so much heart and she builds an incredible structure [which has] bones, but there's no connective tissue to it. Nobody at the company knows how to build connective tissue, and that's when Ben comes in. He figures out how to get everybody to connect to each other. In this day and age, we have the tools for communication at our disposal, but we're using them in such a way that sometimes [we aren't] taking full advantage of them... Or maybe, that's taking full advantage of them, but that's just not as effective as having a one-on-one conversation. So I thought it was a great that Nancy made observations about how old school meets the new world, and each is made better because of the other. Are you as technically challenged with computers as Ben is? Robert De Niro: I'm a little less technically challenged, but I'm not far behind. You're such a great mentor to Anne's character in this movie. Was there a mentor in your life who really made an impact on you? 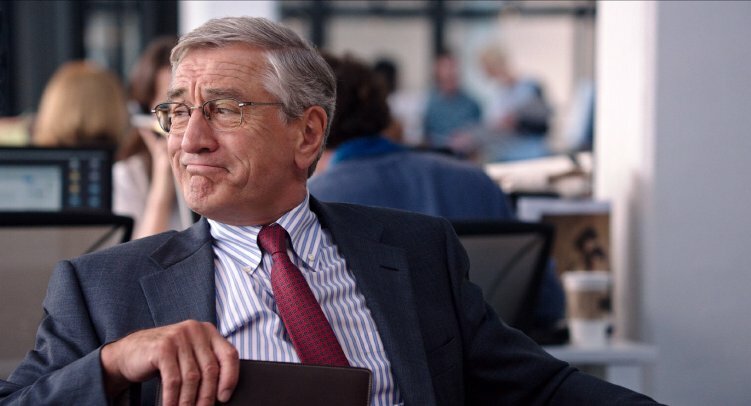 Robert De Niro: No, I never had a mentor like that. I don't envy, but I do think that's a great thing if you are lucky enough, especially if you are in a certain untenable situation, and you have a mentor who'll change your life. They can do that. I mentored myself, in a lot of ways. It's a great thing, you know. I like to give advice to younger people if they ask me. I have at times asked people who were further on in their careers, like [director/writer] Elia Kazan or certain actors who were a generation ahead of me. I asked them what to look out for, blah blah, because I wanted to take a shortcut in some things. I don't want to have to experience something if I don't want to � [especially] if it's going to be a negative one. So I would just get some words of advice. I do that with people if they ask me. I don't volunteer it, but I'm certainly there if somebody [asks]. I have some young friends who sometimes ask me stuff and I give it to them, my opinion of what the situation is. What's the advice you tell young actors? On the flip side, you've had interns when doing Tribeca Film Festival and with your production company, so what experience did you have with some of your interns? Has doing this movie made any of you appreciate your interns differently and change how you will look at them and treat them going forward? Robert De Niro: Well, I have some interns who I now work for. Hah, what do they tell you to do? Robert De Niro: No, they're just very respectful, and they never forgot where they were working, so it's nice. I'm very proud of them. It's great. You know, with Tribeca, through all these years, it's a great thing. Any other thoughts on how they're going to treat their interns? Nancy Meyers: Well, one of my interns is in the movie. The kind of scruffy kid that sits to Bob's right, he was my intern on It's Complicated. I think unconsciously I was writing [the character with] him in mind. I wasn't fully aware of it until I emailed him one day. He said the email said, "Can you act?" just in the subject line. I didn't actually write anything in the email. Nancy Meyers: He was pretty good, right? He's never acted before! Anne Hathaway: I don't have an intern... because I'm not them. [referring the De Niro and Meyers] I'm not that impressive. But I was on a photo shoot recently, and I was greeted by an intern, at the top of the day when I arrived. Because of our movie, I think I went out of my way to pay her a little extra attention, ask her questions about who she was, why she was doing this, and where she wanted to go. I thought I was doing something nice, so I was like, "Um, hey, I've got a playlist ready to go, can you do me a favor? You'll be on the music, and we'll like, be in [sync], and, when I want you to play this song, you play this song, and this song," and she's like, "Of course." But I didn't realize the sound system was like, impossible to work. Every time she was trying to it, she would like, leap from iPod to iPod � for some reason she had to do that � and every time she had to do that, it would create the most horrible screech throughout the entire sound system. Everybody hated it. So I was trying to do a nice thing for the intern, and I wound up just making everybody kind of annoyed at the sounds she was making. So now you need to do a website for music, a peer-to-peer program. Maybe Anne, you are now inspired to do your own e-commerce site like some of your contemporaries as Jessica Alba have done? Anne Hathaway: No! Not yet. Can you both speak about collaborating with Nancy and can you share what you admire about her? Robert De Niro: Well, I'm used to doing movies that took as much time as our movie did. I'm from that generation. It just stopped at a certain point, except certain types of big-type science fiction or those types of movies. But Nancy was very specific, as far as telling � we did things in a lot of takes at times, but for good reason. She was very specific about what she wanted [us to do], and I totally got them and understand it. It was terrific. These days, movies are done � they don't have the luxury of extremely long schedules or [high] budgets, unless you kind of just find yourself there, because you're in it and you have to finish it, and it's going to take longer than everybody hoped it would. But anyway, she was terrific, bottom line. What was the shooting schedule? Bob said it was a long schedule � 14 weeks? Robert De Niro: We shot for 15 weeks. About. 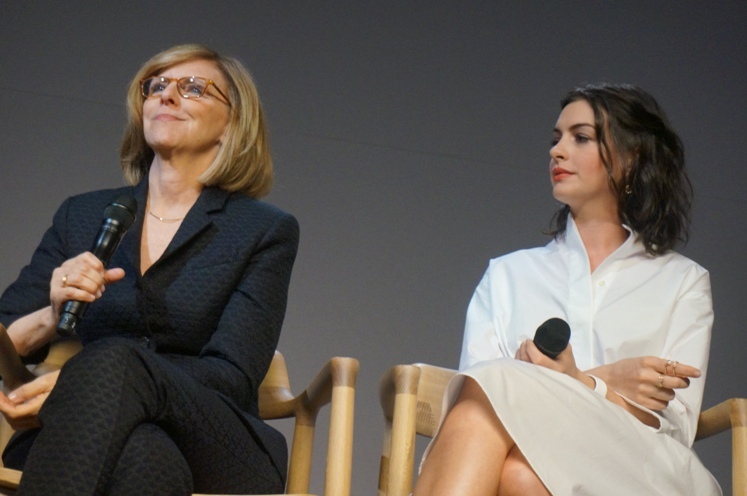 Nancy Meyers: About half of what I'm used to, but twice as much as a lot of movies get [these days]. So for me, I was racing on rollerblades the entire time. Anne Hathaway: If you look at Nancy, you see this tiny, adorable woman with awesome hair. That's at least, at first glance. So I had no idea of the tenacious, uncompromising, inexhaustible powerhouse that she is. I'm so lucky that I got to work with her on this, in terms of collaboration � it's true, though. I had admired you, and now that I've made a movie with you, it's beyond [that]. When we started, we saw the character in two different ways. I wanted her to be wearing her stress more on her sleeve. Nancy wanted Jules to have it a little more together. I had this moment where I was like, "Okay, we see it different ways; am I going to feel so uncomfortable the entire time if I'm not following my instincts?" Nancy Meyers: Oh my God. Anne Hathaway: I don't know, I hope this movie is such a global hit because she deserves it. Nancy Meyers: That's the nicest thing anyone's ever said about me. Thank you so much. What makes it easy though, I have to say, is that these two actors are great people. So when you're surrounded by great people, they make you better, and allow you to express yourself all the time. They're open and, like I was saying with Bob earlier, they're safe, you know? That's all you want... That's what we all want when we make a movie, to feel safe to be ourselves and get what we need. They allowed me to do my work in a way so that it's up on the screen. The result's on the screen, what we all did every single day for that short amount of 14 weeks, that barely was there, as far as I'm concerned. How much would you say that you enhanced each other and changed each other's lives as characters? Robert De Niro: How did the characters influence each other in the story? Um, well, it's what it is. I mean, she learns from him, even though he's older and all that. We tend to � not disregard � but just... People [as they] are getting older, they're kind of sidelined, in a way. The point is that he's someone very important. 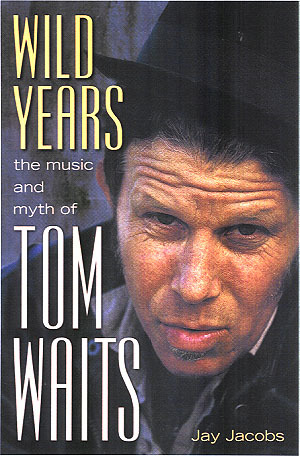 If you stop, look and listen, he has advice that only somebody who'd been on the planet a lot longer can give. It's really that simple, so she gets that from me, and my character, and I get certain things from her. I wish I had said it more eloquently, but I guess that's it. How would you say that this film speaks, perhaps differently, to the two audiences, the younger and the older audience? Robert De Niro: I don't know, that's a good question. I just don't know. Anne Hathaway: Can I pick that one up? Anne Hathaway: (Laughs) It's a scene where a character's over at Ben's house, and they're talking, and he puts his beer on the coffee table, and Ben looks down and he goes, "Why would you put your beer next to the coaster?" I just feel like my generation laughs because we're really bad about using coasters, and Boomers laugh because it's a legit question. That's an example. So many of the jokes work both ways. They're so satisfying. So in terms of what Jules gets from Ben... you know, it took me a long time to kind of crack Jules, because I kept looking for her deep, dark secret. It turns out she's just a really wonderful person on the inside. That's actually the secret, her strength. That's what makes her a good boss, that she's a deeply decent and nice person. The reason the story is being told about her in this moment, is that she's in a moment of unbelievable stress. She had everything she needs to navigate this moment except space and a compassionate ear. That's what Ben brings into her life, a tremendous amount of compassion. I don't know if that's a generational thing or what, but I feel like there's a lot of judgment in the world, particularly when people are in a more visible position, like Jules would be, as the CEO of a startup, where her business has grown so quickly. There's a lot of judgment for people who are in those kinds of positions, and Ben doesn't judge her, he just observes her and opens her, gives her a safe space, [one] full of compassionate understanding. And she thrives on it. Actually, [Ben] does that to a lot of people around him. They all thrive as a result of it. It's a simple thing, but it's not something we see very often in our world. It's something that I think, if we could see more of or perhaps contribute to, we'd see a lot of really positive results. The characters were complex and real. They have an inner life. If you sat down with them and got to know them, what questions would you like to ask them? What advice would you give them? Robert De Niro: If I had an actual model of somebody, say hypothetically this person was a real person she was basing him on, I would just ask him a lot of questions about their everyday habits. What they think about things, just on and on. That's what I would do. What would you want to know about your role? 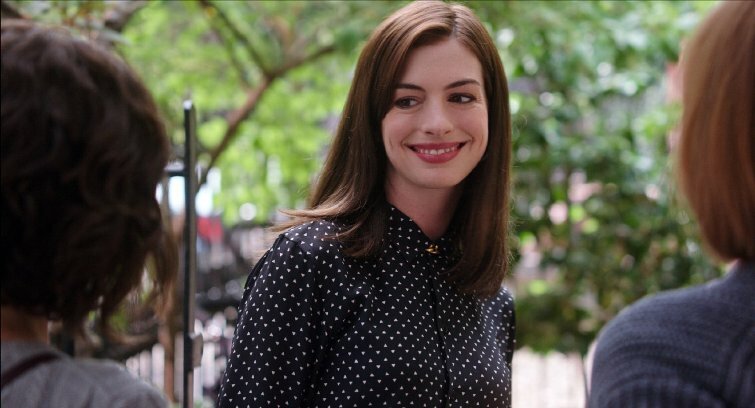 Anne Hathaway: It's so hard to � honestly, because I asked all the questions. I created what she's interested in, along with Nancy, so I don't feel like I have that many questions left of her. What advice would you give her to be happier? Anne Hathaway: Oh, God. We're the same age, I don't know that I have any authority to give her advice, necessarily. Honestly, by the end of the movie, I'm on her side. In the beginning, you would [tell her to] make more time for [herself], but by the end of it, Jules really is doing the best she can. She's being authentic to herself and her feelings. I don't think she's a dramatic person who craves confrontation, and she's honoring that aspect of herself. By the end, she's treated herself and everyone around her with respect. Oh, I know what advice I would give her. Value your assistant more. But Ben gives her that advice so she doesn't need to hear it from me. In some ways, this movie is both a two-way mirror and a rearview mirror; you can see the front and backside view of characters. Is there a particular time that gave you angst, that now today you look back on it and say, "Why was I so worried? Why was I so fearful?" 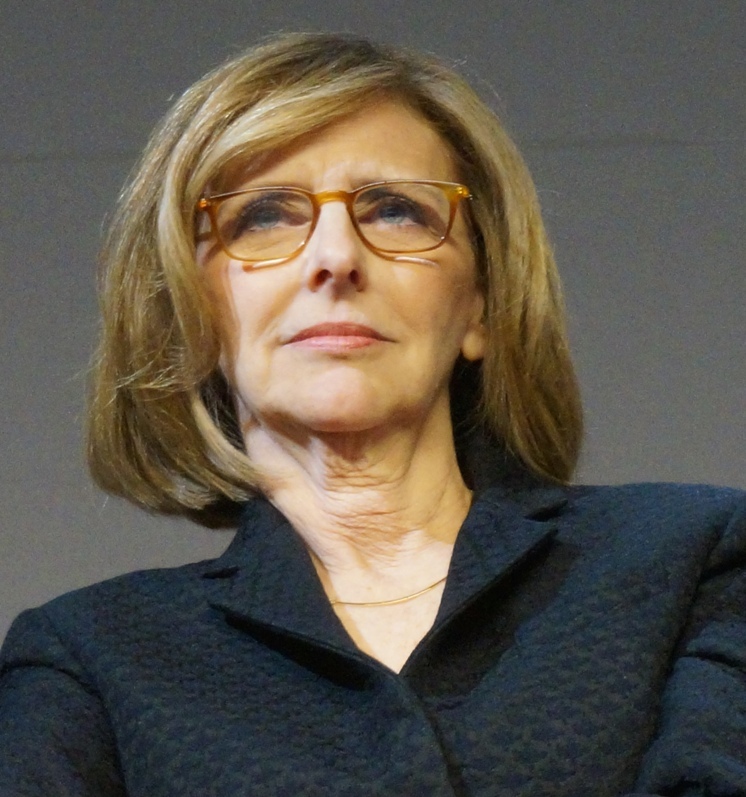 Nancy Meyers: Well, I have so much angst at this age. So, let me try to rewind... Doing what I do and putting yourself out there, making a movie, this is what I want to make a movie about, and wrangling all these brilliant people to go along with you, there's a lot of angst. Am I doing the right thing? Am I serving them correctly? Is the audience going to want to go see it? Then the movie comes out and it does well and I think, "What was I so worried about?" I go through that a lot. I'm trying to teach myself to just calm down about it all a little bit as I get older. Robert De Niro: Anxiety is always there. As long as you're alive, you're going to have anxiety about something. The things that were important 15, or 20 years ago are less important today because I know that I can get the same results with certain things. It doesn't warrant as much angst or anxiety about that, how to solve that problem as I thought then, now. Nancy Meyers: He's a really, kind of zen guy. You know? But like, on the set. Anne Hathaway: He's a Jedi. Nancy Meyers: There's a like, a gazillion people running around, and he's just sitting in a chair, having a little tuna sandwich, on a phone, and it's just � the world can be going by, he's got it down. He's just got it down. He's always there when you need him. By the way, I think that really helped everybody in the movie, seeing that. Because, you know, [he was] just right there, calm. Did you cast Jules' assistant as the younger version of Ben? Because I think that that character's going to become Ben. Nancy Meyers: You mean Andrew Rannell's character [Cameron]? Oh, that's interesting. I hadn't thought of that. Hopefully we can all become Ben. Robert and Anne, what did you do to prepare for your dynamic in the film to establish this deep friendship? Anne Hathaway: Bob and I did some extreme bonding at the Century 21 Mall. No... (laughs) You know, that's the funny thing. I just trusted everything was going to be okay. We didn't do anything special. Bob's an easy guy to get along with... He is, as Nancy said, incredibly zen, calm and approachable. Once I could get over the fact that I couldn't talk around him for the first three weeks, I just felt like an idiot with everything I said, once I calmed down about that, I just trusted the words. It didn't matter how I felt, because Jules feels comfortable around Ben, and I just trusted that that was going to carry us. And Ben feels comfortable around Jules. Nancy was going to guide us, and it worked. Also, I just had a lot of film history on my side. Bob's good at having chemistry with people, so I assumed that as long as I didn't mess it up, we'd be okay. Robert De Niro: She just said it. Nancy, why was it important for you to explore this dynamic? Nancy Meyers: See how zen that is? One sentence says it all. I had never written anything like that before, and so it grew as I wrote it. It grew, and became more clear to me as I was writing it. It's what really was the engine that was driving me, this relationship. I was wishing I had somebody like this, because I've been asked a couple times who mentored me. I didn't have that person. I know people say I write "wishful filming" � well this is kind of "wishful filming." A different kind of wishful filming � wouldn't it be great to have somebody on your side at really stressful times of your life who doesn't say, "Your 45 minutes are up," you know? Like, who's really there for you. Robert De Niro: Your 45 minutes are up, and by the way, it cost you this. Nancy Meyers: Exactly. That's the fun thing about being a writer. You get to create scenarios that you maybe don't have in your own life. Someone once said, "As you define your art, your art defines you." What, if anything, did each of you learn about yourself in the process of making this film? Robert De Niro: I don't know if I learned anything about myself that I didn't know already. I had a very good time doing the film. It was just a really terrific experience. Nancy Meyers: Well, it was different for me. The making of this film was different. I'd never been on practical sets before; I'd always been on sound stages and had walls that move, and that kind of stuff. So it was actually fun. I was scared in the beginning, but it turned out to be... There would be times where directors sit in front of a monitor, but with those Brooklyn houses, I was under the stairs, wasn't I? Anne Hathaway: You were. You were like, in Frodo's house. Nancy Meyers: I was. I'd get up and stay hunched over as I walked. So for me, I learned... There were new challenges, not just performance challenges, but in the way we made the movie. It was interesting. I know you want a deeper, better answer, but I learned about another way of making a movie. Anne Hathaway: I can't explain why it happened for me on this movie, if it was my character or the dynamic or just being around Bob's zen or what, but up until now I've made a lot of my movies from a place of insecurity and neuroses and self-doubt. I just got really tired of it and decided to make one from a more positive place. To feel good about what I was doing. Embrace the unknown and not necessarily assume that if I didn't have a clear idea of how things went, that it necessarily meant it was bad. I could actually trust that the unknown could be good. I actually had a wonderful time making this movie, and it yielded a more relaxed performance [from me]. I'm really proud of the work we all did out there � what we created. It turns out that you can make a movie without having nonstop sleepless nights. 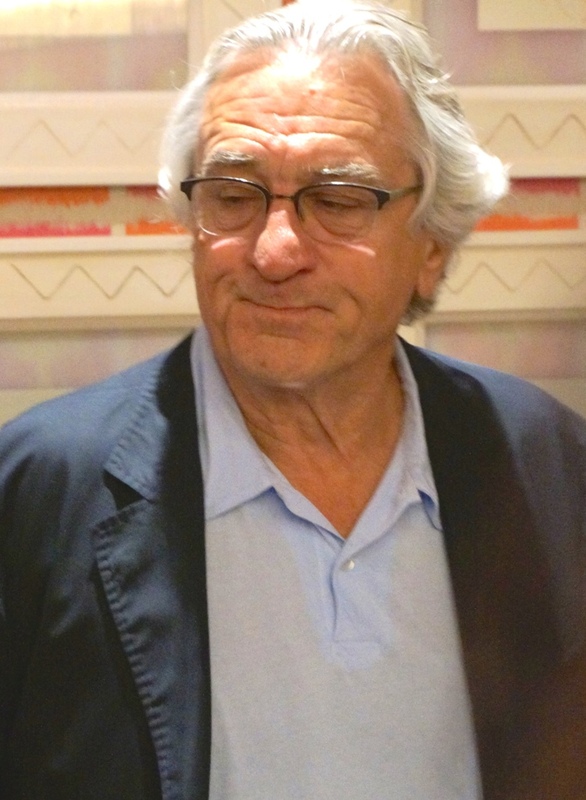 CLICK HERE TO SEE WHAT ROBERT DE NIRO HAD TO SAY TO US IN 2010! CLICK HERE TO SEE WHAT ROBERT DE NIRO HAD TO SAY TO US IN 2014! CLICK HERE TO SEE WHAT ANNE HATHAWAY HAD TO SAY TO US IN 2013! #1 �2015 Courtesy of Warner Bros. All rights reserved. #2 �2015 Courtesy of Warner Bros. All rights reserved. #8 �2015 Courtesy of Warner Bros. All rights reserved. #9 �2015 Courtesy of Warner Bros. All rights reserved. #10 �2015 Courtesy of Warner Bros. All rights reserved.